If you have ever recorded video in a noisy environment only to find out later that your video looks fine but sounds horrible then you need a shotgun microphone. These microphones help eliminate the noise you don’t want and record what you do. MXL makes a dizzying array of microphones suited for all types of purposes. The MXL FR-310 is a budget conscious shotgun microphone for the average consumer and beginning videographer. Most shotgun microphones employ what is known as a cardioid polar pattern. This is a technical term used to describe the area where the microphone is most sensitive. In this case a cardioid polar pattern refers to the area directly in front of the microphone. This is not to say that the microphone wont pick up sounds to the side and behind, but rather that it is less sensitive to them and as such will record less peripheral sounds. The following graph illustrates the differences. The MXL FR-310 uses a Supercardioid polar pattern meaning that in it’s simplest term, a Supercardoid polar pattern has a narrower pattern than a Cardoid. In other words, it has better rejection of sounds “off axis” from the front of the microphone. This will help in the elimination of those unwanted noises in the background that often detract from interviews, and other various recordings. 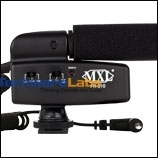 The MXL FR-310 is designed to be “Hot Shoe” mounted for digital cameras which a microphone input. This is great for photographers that want the ability to record video where the standard included microphone is less than ideal. Now that you know what a Supercardioid microphone is and why you need one let’s take a look at the MXL FR-310 and see how good a job it does.